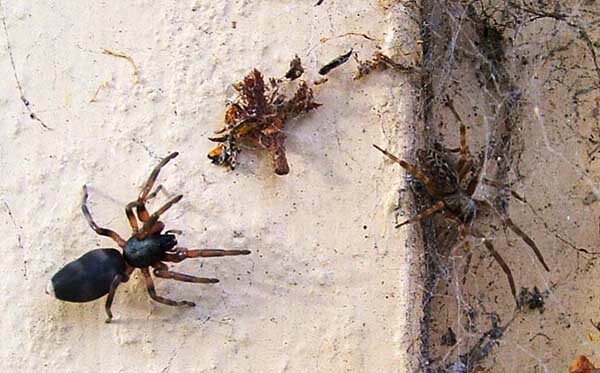 This big female White-tailed Spider (15-20mm) stalks a Brown House Spider (Badumna longuinquus.) She is in the alert position and ready to leap forward should her prey make a false move or get tired and lose concentration. Her prey is very much aware of her presence but this species and their close relatives the Black House Spider (Badumna insignis) will not leave their web until it is too late. 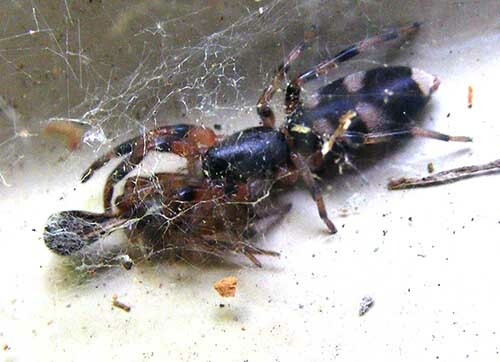 The White-tailed Spider will sit for hours without moving once once she gets this close to an attack. It is a deadly game for both spiders. This was an old fibro garage wall and that summer it had been festooned with hundreds of Black and Brown House-spider webs. A couple of weeks after we noticed the first White-tailed Spider the numbers of House Spiders was lowered to one or two every fibro panel and the balance seemed to be found and remained that way for the next few years. 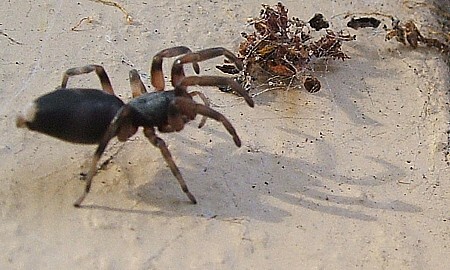 These spiders are common under rocks in gardens and will often come into houses hunting their favourite food. I have had these spiders about for years and never seen one looking to attack a human although the males are very active in the mating season and can be found running all over the place. They can be aggressive at this time and probably should be removed and released outside. Apart from that I used to make it a rule to let them find their own way out. That was in the house at Budgewoi as I knew it had no screens and it was easier for them to find their way out than for me to catch them. I don't kill spiders in my home and unless you have very small children it is not necessary to kill everything that crawls and looks nasty. They are a part of good gardening and looking after your world.